BOLOSO SORE, SOUTHERN NATIONS, NATIONALITIES AND PEOPLE’S REGION, 26 January 2017 – It was a sunny afternoon at the Chamahinbecho health post and the trees planted by health extension workers 10 years ago provided much needed shade in the compound. A group of mothers were sitting under the trees discussing how to best feed their toddlers and among them was Beyenech. 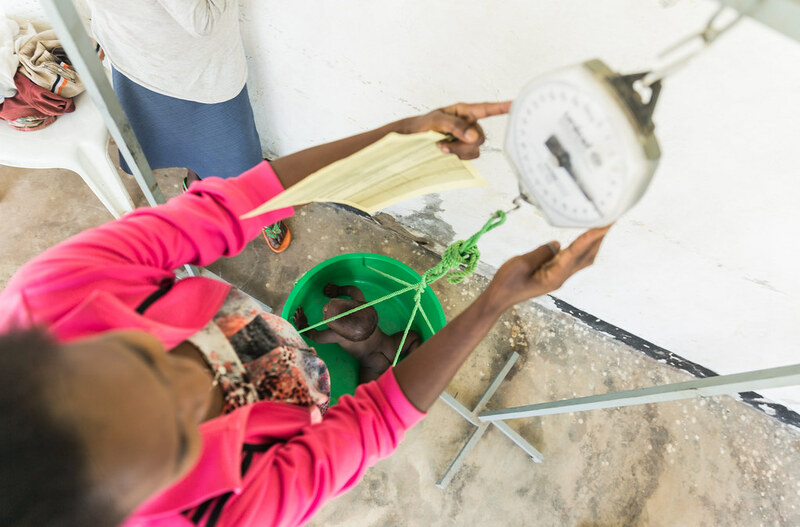 The cheery Beyenech, a mother of three, came to the health post to get her 1-year-old son weighed as part of the growth monitoring and promotion session that they attend on a monthly basis. 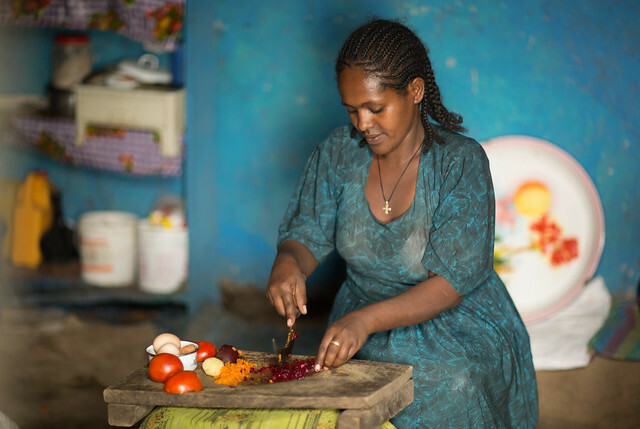 Beyenech is among the many mothers in Chamahinbecho kebele (sub-district) who are benefiting from a project supported by the European Union called EU-SHARE. The project aims to contribute to improved nutritional status of children under five, adolescent girls and pregnant and lactating women through strengthening nutrition outcomes of Government health, food security and livelihood programmes. The strategy involves integration of the multi-sector interventions at the household level to create synergetic effects that will maximize programme results. 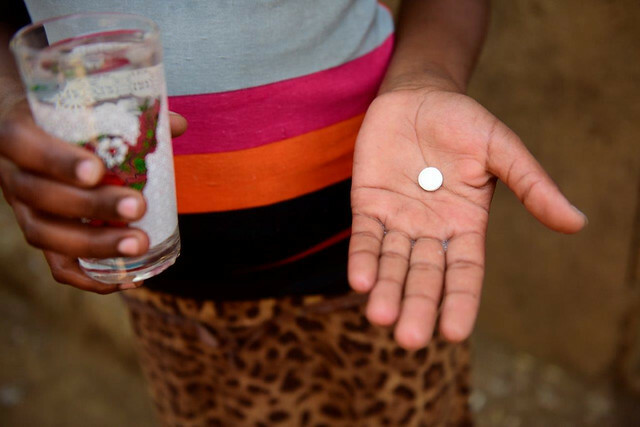 Deworming of intestinal worms and schistosomiasis is an important service for young students, as both ailments affect the health and education of children and adolescents. A student with worms will be too sick or tired to attend school or will have difficulty concentrating in school. If left untreated over time, they may face stunting or malnutrition due to anaemia, as well as impaired cognitive development. The Government-led programme, which is supported by EU-SHARE, contributes to the health and nutrition status of adolescents while improving school attendance rates. EU-SHARE project supports the programme through procurement of deworming tablets, provision of information, education and communication as well as behavioural change communication materials that are helpful to create awareness and initiate discussion on nutritional requirements during adolescence. The programme also includes technical support to health workers who carry out the deworming campaigns. Students like Wubalem have a better chance to succeed with their education due to initiatives like these. EU-SHARE also includes nutrition-sensitive agriculture interventions which is implemented by FAO as part of the Government’s commitment to integrate nutrition into the agriculture sector. Promotion of backyard gardening is among the initiatives being implemented in the kebele. Beyenech aspires for her children to have a better future. She wants them to be top students and become teachers or doctors so they have the knowledge and skills to impact the next generation in the community. 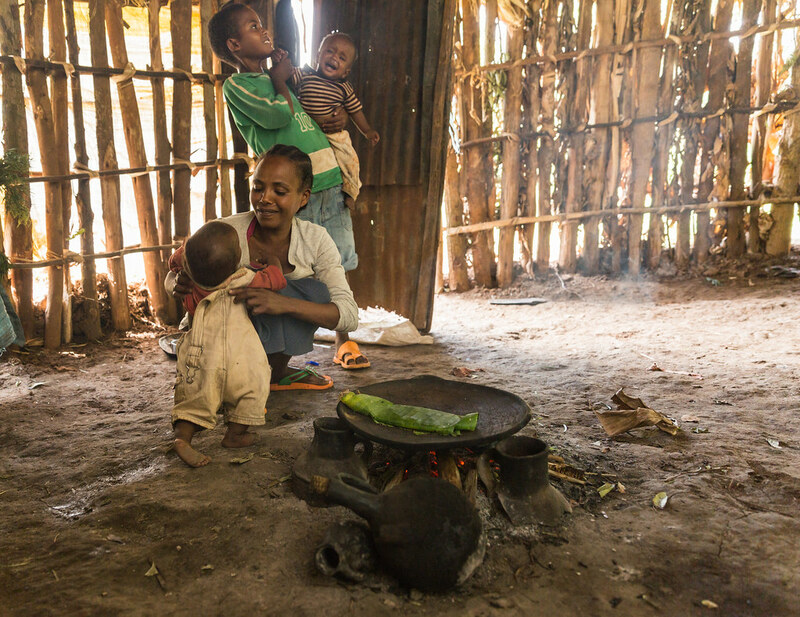 “Such type of nutrition interventions that consider integration as a cornerstone by addressing the different aspects of nutrition are a key weapon to combat the problem of malnutrition in a sustainable manner,” said Israel Mulualem, the nutrition focal person in Boloso Sore woreda health office. 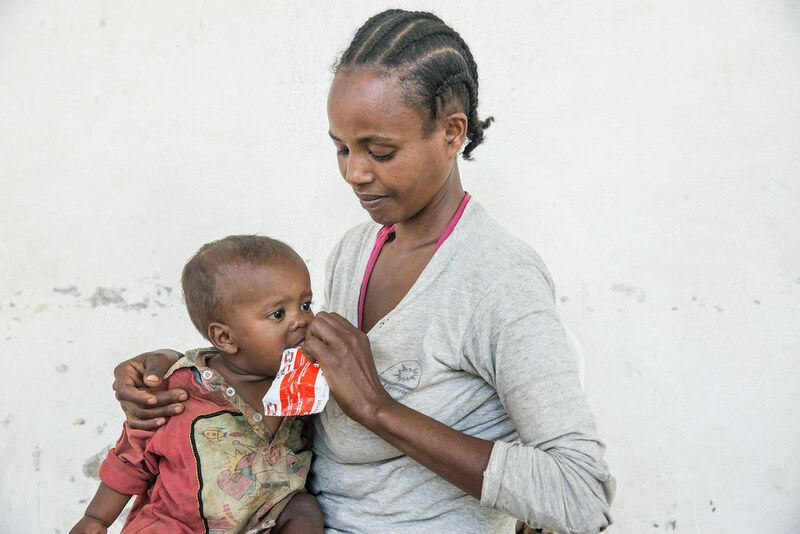 The four-year EU-Share programme has been operational since 2015 and continues to support children, mothers and their families in seventeen woredas located in SNNP, Oromia and Amhara regions. 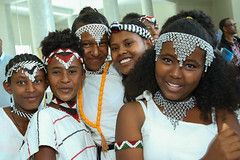 Together with the Government of Ethiopia and donors such as the European Union, UNICEF is able to support existing initiatives of Government programmes so that children such as Wubalem, Setot and Teketel may have a bright future. Southern Nations, Nationalities and People’s Region, Ethiopia, 23 February 2016 –Tesfatsion Alemayehu wants to be an engineer someday, but the 14-year-old girl has trouble concentrating in school. She is often dizzy and light headed and complains of a stomach ache. 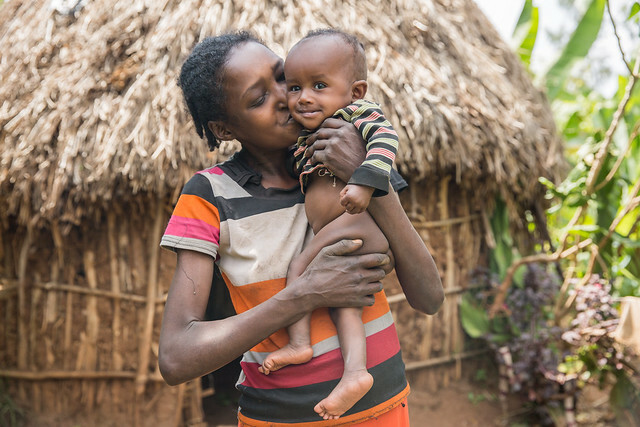 Intestinal worms and bilharzia are rampant in Ethiopia and children suffering from these afflictions are often too sick or tired to go to school or concentrate. In the long term, the result is malnutrition, anaemia, stunting and even impaired cognitive development, all of which result in poor educational achievement. 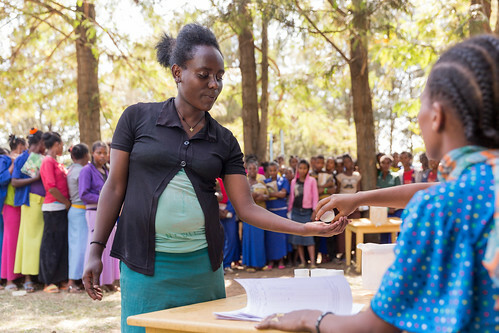 So one day in February, Tesfatsion is standing in line at her Gurmu Koisha school where she will receive a de-worming tablet from the local health extension workers. The tablet will take care of Tesfatsion’s worms which could be schistosomes that cause bilharzia and are carried by snails that live in fresh water. Once the worms are gone, she will be able to concentrate in school again. The programme, which is funded by EU-SHARE and implemented by local authorities and UNICEF, is much more than just giving pills, however. In the shade next to where the students are lining up, trained nutrition club members are conducting games that impart key nutrition and hygiene lessons. These activities, known as behaviour change interventions, help the students understand the benefits of the tablets and teaches helpful nutrition and hygiene practices that can minimize future parasitic infections. For her part, Tesfatsion particularly likes the “Who am I?” game in which students learn about six common iron-rich food groups. Learning about which foods contain iron is especially valuable for young girls like Tesfatsion as they start menstruating. 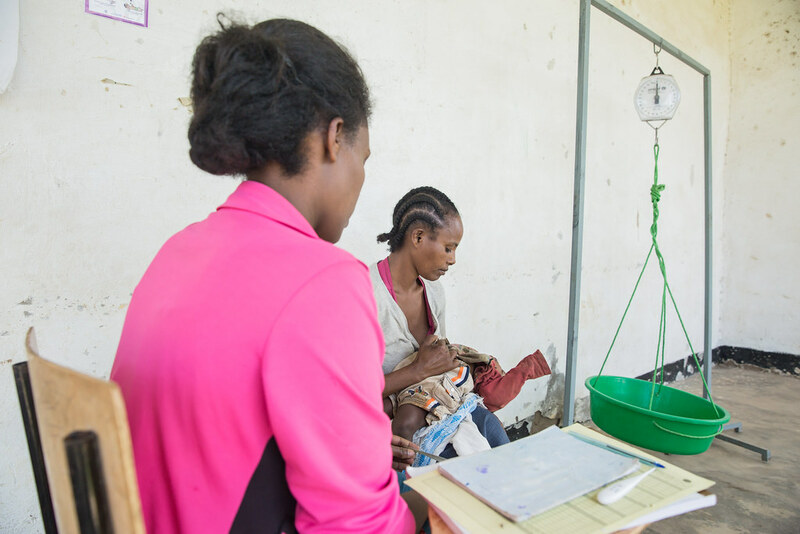 Samson Alemayehu, the head of the health bureau at Boloso Woreda, where Tesfatsion lives, said his department is working with the schools to provide these services. “We believe that Behaviour Change Communication interventions that take place in the schools by health and nutrition clubs play a big role in increasing awareness in the community, particularly on basic hygiene sanitation and optimal feeding,” he said. 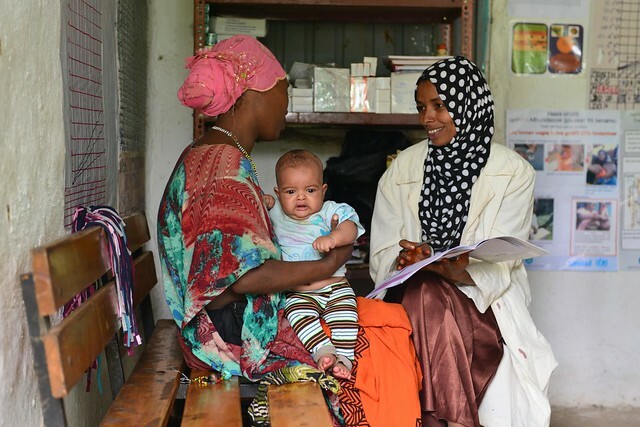 The Health Bureau implements the program through the Health Development Army, which is present in every community and the 1-5 network, in which one person is responsible for five others. The programme supports the integration of water and sanitation as well as nutrition education into the large scale de-worming campaign in 436 woredas across the country. It also supports the de-worming specifically of adolescents in high schools in 86 woredas in Amhara, Oromia and SNNP regions free of charge. 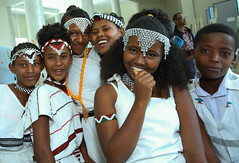 “I need to attend all the classes and study hard to make my dream a reality,” said Tesfatsion. ADDIS ABABA, September 2016 – Ethiopia has experienced repeated droughts, particularly in the past few years, which have eroded rural livelihoods, causing increased food insecurity and malnutrition among vulnerable communities. The 2015/2016 El Niño-driven drought, for instance, left 9.7 million people in need of emergency food assistance. In response to recurrent food insecurity, UNICEF has partnered with the European Union (EU) to contribute to building resilience of the most vulnerable groups, which includes children under five, as well as pregnant and lactating women. Resilience, or the ability of a community to withstand, adapt and quickly recover from shocks such as drought, is a cornerstone of the EU’s humanitarian and development assistance. 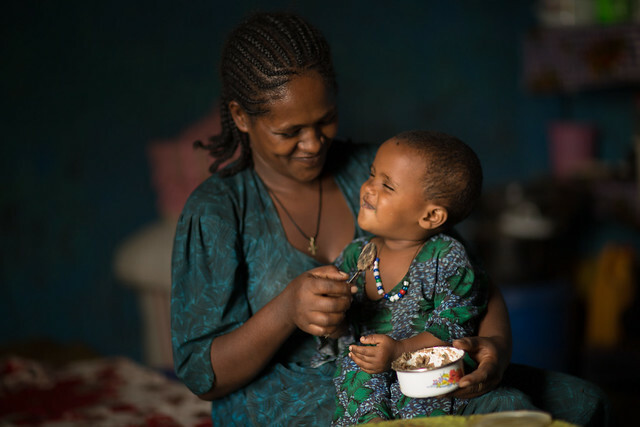 To this effect, the EU has provided €10 million to UNICEF-assisted programmes as part of its Supporting the Horn of Africa’s Resilience (SHARE) initiative through a project entitled Multi-Sectoral Interventions to Improve Nutrition Security & Resilience. 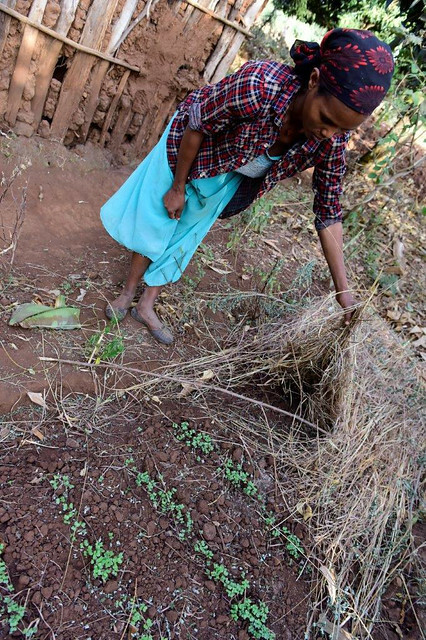 The project is implemented in collaboration with the Food and Agriculture Organization of the United Nations (FAO) in the drought-affected woredas (districts) of Amhara, Oromia Southern Nations, Nationalities and People’s Region (SNNP) regions, benefiting 773,626 mothers and children. The project aims for communities to have access to quality nutrition services in their vicinity and a better understanding of the importance of proper infant and young child feeding (IYCF) practices. It covers a wide range of interventions including the promotion of exclusive breast feeding and adequate complementary feeding, vitamin A supplementation and deworming of children, as well as the promotion of hygiene and sanitation. This is complemented by a series of nutrition-sensitive agriculture interventions led by FAO in partnership with the Ministry of Agriculture. This component helps build the capacity of women to improve the variation of their diet through livestock and poultry rearing, as well as backyard gardening. It also brings opportunities for women to collaborate as peer support groups to produce nutritionally valuable complementary foods such as cereal mixtures for sale. This stimulates the local economy by creating jobs and empowering women to ensure the healthy growth of their children. One achievement of the project was an initiative to analyze and document the nutrition situation in the country from 2000 to 2015. The report was launched in March 2016 and highlights critical gaps in terms of existing policies and programmes which need to be addressed urgently to accelerate nutrition results for women and children. 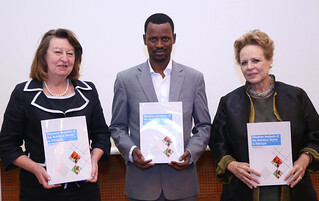 Key findings of the situation analysis report include poor water supply and sanitation as high risk factors for child stunting, educating mothers as a key factor for improving nutrition, as well as the need to improve production diversity, nutrition knowledge and women’s empowerment to ensure that diverse and nutritious foods are available and accessible at all times. The SHARE project also serves as a platform for multiple non-governmental organizations where they can exchange expertise and best practices to improve implementation and follow a harmonized approach in their respective intervention sites. This way, efforts are combined and the impact on the nutrition status of children and women will be maximized. 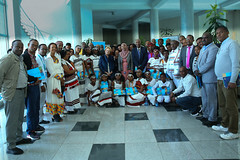 UNICEF would like to express its gratitude to the EU for the generous financial contribution to UNICEF-assisted programmes and looks forward to strengthening successful collaboration for children and women in Ethiopia. Thanks to EU support, over 225,000 children under five and over 50,000 mothers will have better access to improved nutrition services. 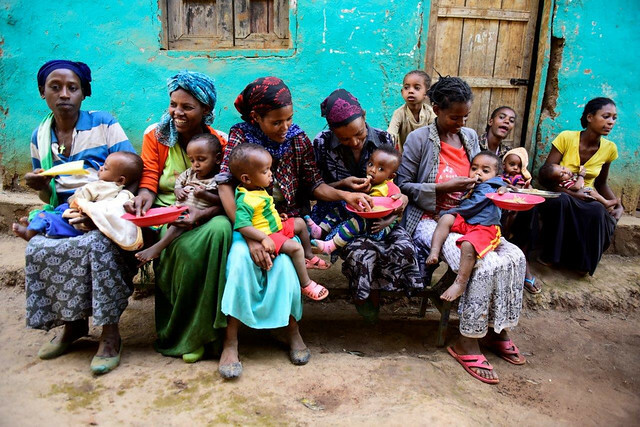 This is in line with the efforts of the Government of Ethiopia to realize the Seqota Declaration to make undernutrition, in particular child undernutrition, history in Ethiopia. SOUTHERN NATIONS, NATIONALITIES AND PEOPLE’S REGION (SNNPR), November 2016- Poverty and drought have left people in many parts of Ethiopia to grapple with food shortage; SNNPR is no different. 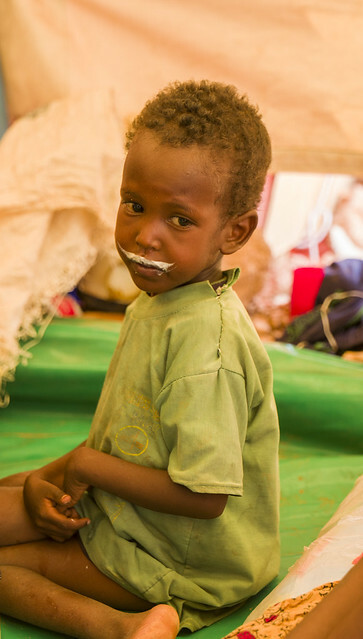 Children are most affected, as evidenced by a high number of severe acute malnutrition (SAM) cases. 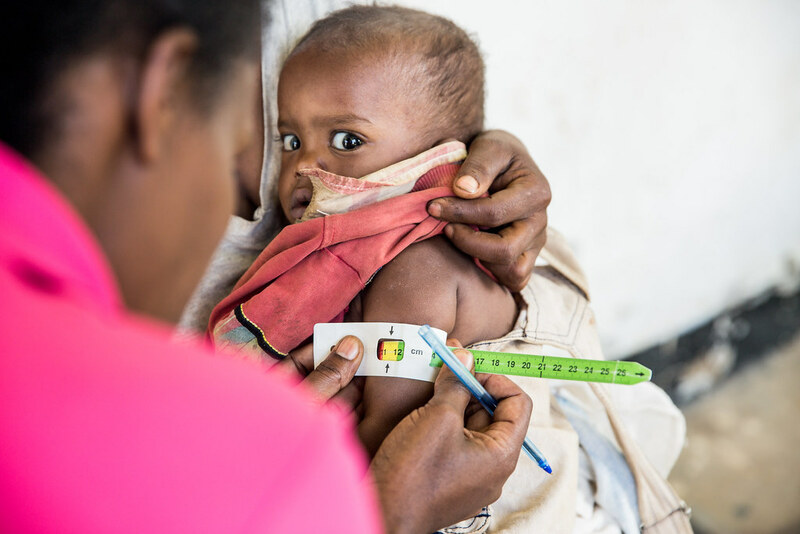 Fortunately, the Government of Ethiopia implements the Community-Based Management of Acute Malnutrition (CMAM) programme, supported by UNICEF with generous contribution from European Commission’s humanitarian aid department (ECHO). 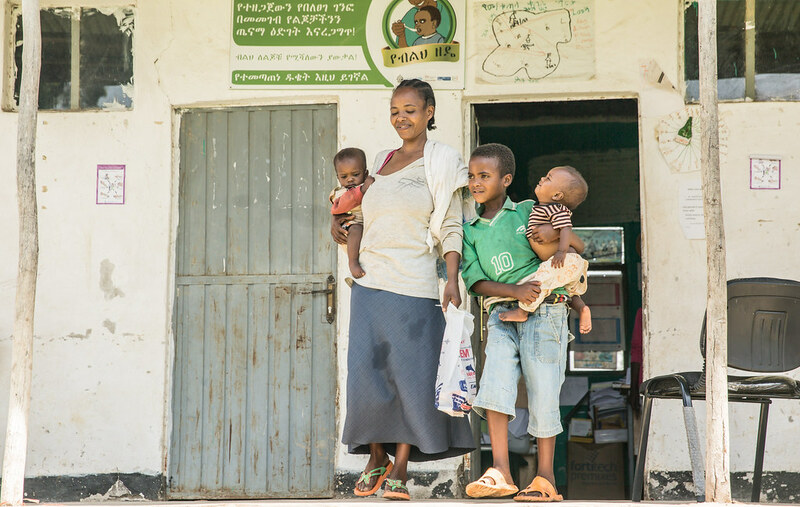 The programme enables children affected by malnutrition to receive life-saving services at stabilization centres (SC) and health posts, such as 32-year-old Bogalech Boreda’s twin infants. 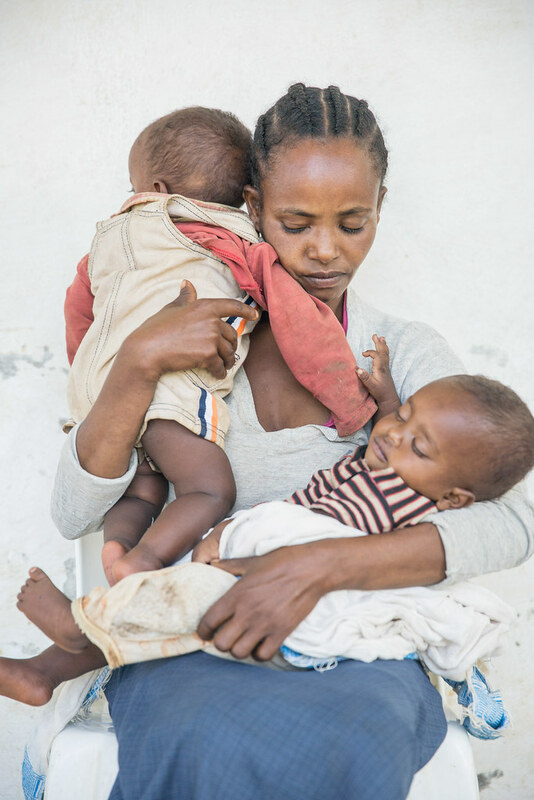 Bogalech’s 10-month-old twins Kibru and Tegegn have been in the Outpatient Therapeutic Feeding Programme (OTP) for SAM more than once. Since Bogalech has three more children at home, she says feeding the twins has not been easy. She gets help from her older children when they return from school, such as Caleb, 12, pictured here holding one of the twins. Still, taking care of the infants occupies most of Bogalech’s day, making it impossible for her to work. Her husband is unemployed with an additional two children from another wife, his earnings from a small plot of farm land are not enough to provide for them. 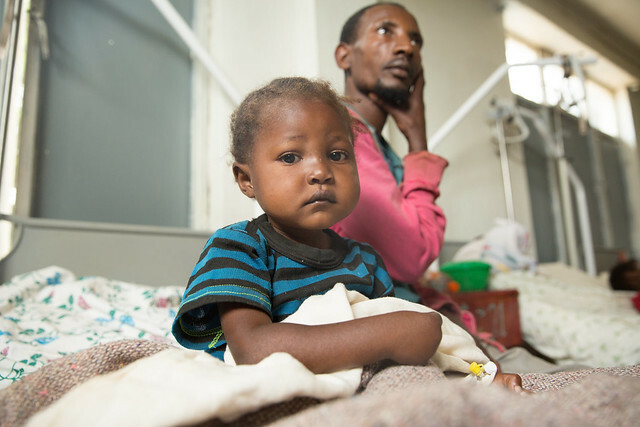 Three weeks before the picture was taken, Tegegn suffered from diarrhoea and was referred to the Stabilization Centre (SC) at the kebele’s (sub-district) health centre. After a few days of antibiotics and therapeutic milk treatment, he was referred to the health post for OTP to continue his treatment as an outpatient. Since his brother’s situation was not much better, both were enrolled to receive the RUTF. In the two weeks since the boys’ treatment began, Bogalech says she has seen progress on her babies’ health and appearance. “They love the [RUTF], they just cannot get enough of it. And the thought of having something to give them when they are hungry gives me such relief,” she adds. Since she is nursing them and providing additional food in her home, she hopes they will grow strong and healthy. Their middle-upper arm circumference (MUAC) and weight is measured every week until they reach their target weight for discharge. Currently at 6.2 kg, Tegegn’s target weight for discharge is 6.9 kg, which is still about 2 kg underweight for an average 10-month-old boy according to World Health Organization guidelines. His MUAC was 10.9 cm when he was first enrolled for treatment and has now reached 11.25 cm. Bogalech dreams of starting an avocado and corn flour business in the market to support herself and her children.